African violets are one of the most popular plants to keep in the home. Fortunately, they are one of the easiest, too. Once you’ve started a nice collection, you can grow new plants from a portion of a mature leaf. This is an inexpensive way to get new plants that display the same characteristics as plants you already have and like. 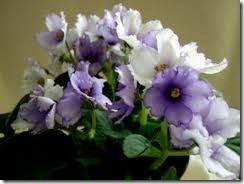 Pick an African violet plant to reproduce and wash it in warm water. Allow the plant to dry thoroughly in a warm spot away from direct sunlight. Select a leaf on the plant that is in good condition. Inspect the leaf for insect activity by turning it upside down and looking for dimples, webs and discoloration. Find the best mature leaf you can and cut the stem at least 1/2-inch from the base of the leaf with a sharp tool. Place the leaf on a clean, level surface and slice the top 1/4 to 1/3 of the leaf off with a sharp tool. Inspect the cut to make sure that it is clean, with no ragged sections that could invite disease. Make another cut on the leaf at the stem, this time at about a 45-degree angle to the stem. Inspect the cut to make sure that it, too, is clean. Keep the prepared leaf in a warm moist place out of the light until ready to plant. Prepare a 2- to 3-inch pot with African violet mix. You can also use a plastic sandwich bag filled 1/3 full with African violet mix. Firm the soil in place. Water the pot or bag with warm water until the soil is moist but not sopping wet. Use a mister if you have one. Place the leaf in the soil or bag to a depth of about a 1/4 inch, enough to keep the leaf upright. If you are using a pot, cover it with plastic to create and maintain a humid environment. Place the pot in a bright location out of direct or afternoon sun. An eastern exposure is ideal. Check the African violet leaf every few days for signs of decay. Add water to the bag or pot when you can no longer smell a strong earthy smell when you open the plastic. Wait four to six weeks before checking the progress of your new plant’s roots. If all goes well, you will see very small leaves around the original leaf. When you touch the soil around the new leaves with a toothpick, it will feel firm. Prepare the new African violet by placing it in its permanent location. If you started your plant in a bag, transplant it to a 3-inch pot to which you’ve added African violet potting mix. Leave a plastic cover on the plant for a week or two until it gets used to its new surroundings. A good way to pick a leaf is to look at an established plant and harvest from a middle tier. The leaves toward the center of the plant will be the youngest, and the leaves on the outermost tier will be the oldest. Middle tier leaves are mature but still young enough to be good choices for new stock. A razor blade is the best choice for cutting the leaf you will be using to propagate your African violet plant. The next best choice is a sharp knife. Although you can propagate African violet leaves in water or vermiculite, they will be more robust when started in soil and require less time to adjust when planted out in their own pots. While roots are developing on your African violet leaf, avoid touching or inspecting it. The rooting process is delicate and it’s important to leave it alone until it has had a chance to establish a healthy root system.